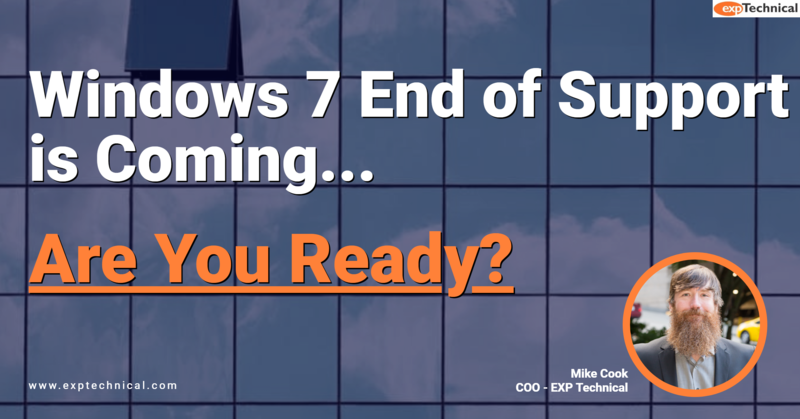 If your company is currently using any of these products, now is the time to transition to an up to date platform for your business computing needs. Waiting until the last minute may put your company at risk and potentially makes the upgrade process more difficult and more expensive. Contact EXP today so we can help you create a plan to update your systems on a timeline that works best for you. There will be no more security or compatibility patches, so any existing or future security bugs will not be addressed. This leaves big holes in your IT security. Your risk of being infected with malware or ransomware is increased, creating a security issue that could affect every system and department in your company. Your applications may not be supported or may not function on the older operating systems. In some cases, you won’t be able to install newer apps at all, so you many not be able to get the business tools you need. You’ll potentially miss out on important security improvements built in to newer operating systems. We’ve had real world scenarios arise where people have had compromises that affected every computer excepting those with a current and patched OS — an avoidable scenario if following best practices. Rather than worry, here’s what we suggest you do instead. Contact EXP to discuss the complications keeping you tied to an outdated operating system. Whatever legacy issues you’re facing, fixing them on your terms is much better than being forced to deal with them due to a cyber security breach or ransomware attack. While we’re at it, we can create a plan to keep your operating system up to date going forward so you always remain as protected as possible. We suggest updating to an operating system that’s no older than Windows 10 or Windows Server 2016. But before you do, it’s necessary to make sure any new system is compatible with all your other applications, such as accounting software, so be sure to contact us to complete an assessment. Addressing end of support issues now lets you run your business with greater peace of mind — and less worry.